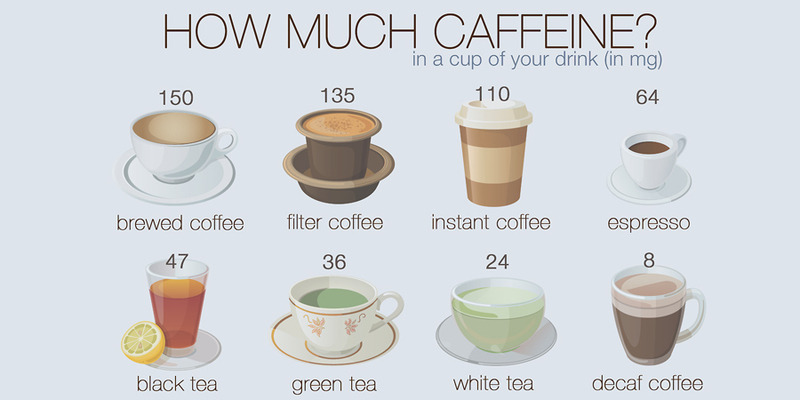 How Much Caffeine In Coffee? Coffee is a favored drink in most parts of the world, and many coffee lovers wonder “How Much Caffeine in Coffee?” However, the answer is not always an exact figure, but generally will fall within a range of numbers. There are several different types of coffees and coffee drinks, and each can have a varying amount a caffeine depending on the blend and how the drink is made. Although experts agree coffee is has many health benefits, too much caffeine can result in serious side effects. Women who are undergoing in vitro fertilization treatment or struggling with infertility should avoid caffeine altogether. Pregnant women should restrict their total daily caffeine intake to 200 mg. For most people, to enjoy the health benefits, curb cravings and avoid side effects, the caffeine sweet spot is around 400 milligrams a day. However, the right amount really depends on how it makes you feel. Many people ask, “is caffeine bad for you?” Dr. Arfa Babaknia, a family physician at Orange Coast Memorial Medical Center in Fountain Valley, California says, caffeine is classified as a drug, so it can be abused. However, provided coffee doesn’t make you hyper, jittery, cause insomnia or give you a headache there really is no harm or no limit. Headache, usually starting behind the eyes and moving up the forehead. Irritability, where everything gets on your nerves. Lethargy, sometimes with a complete lack of energy. Depression. In severe cases, withdrawal can literally drain you of all hope for living. Flu-like symptoms, including blocked sinuses and a stuffy nose. Nausea and Vomiting, preventing you from eating and can compound the feeling of lethargy. Anxiety, withdrawal can cause anxiety and even panic attacks. Brain Fog, with difficulty having coherent thoughts and doing simple, everyday tasks. Dizziness, causing you to lose your sense of equilibrium. Heart Rhythm Abnormalities, including changes in heart rhythm. Low-blood pressure has also been reported. To figure out how much caffeine is in each type of coffee its important to know what type of coffee you drink. 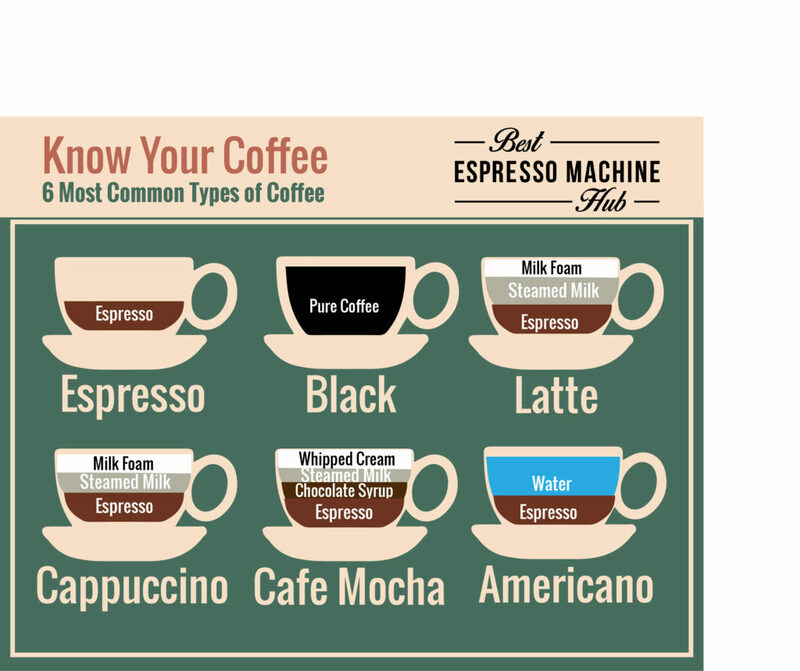 Below we provided a chart of the 6 most common types of coffee. Typically, one cup of coffee contains between 100 to 150mg of caffeine. 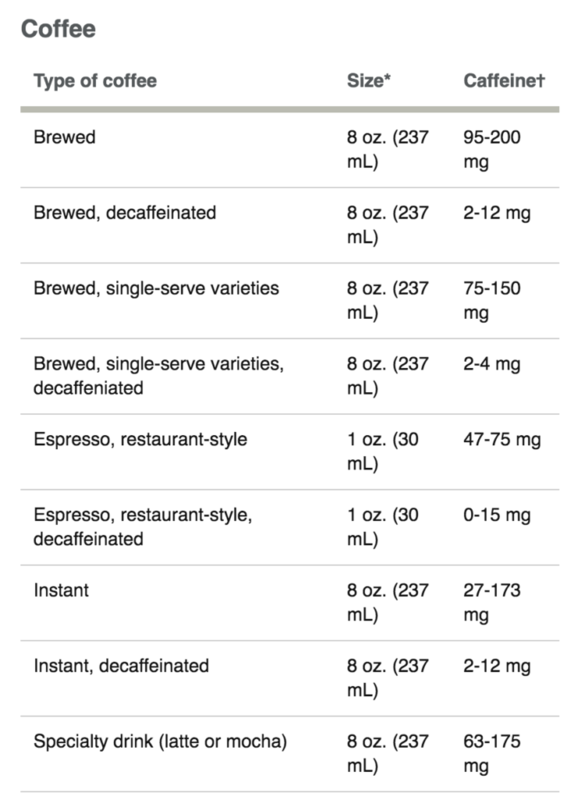 The typical one-ounce shot of espresso contains 64 mg of caffeine. There are some people who are much more sensitive to caffeine and it can cause them to experience the caffeine effect quicker than others. The effects can lead them to become restless and cause sleep problems. It’s important to know how much coffee can effect your body, and when you’ve had too much. When you understand how much caffeine you should have daily, you can then experience the pleasures that coffee has. There are actually many health benefits of coffee , Click Here To Read More! A: Those wanting to completely eliminate caffeine will have to also give up green tea or switch to a decaffeinated version. However, for those merely wanting to reduce their daily caffeine intake can substitute green tea for coffee. A cup of green tea contains roughly 25 mg of caffeine, about 70 percent less than the standard cup of java. However, there are several variables that can affect the amount of caffeine. As an example, the longer tea is brewed for the more caffeine it will contain. Additionally, green tea also contains two other substances, theobromine and theophylline, in addition to caffeine that that can affect heart rate. Q: Does Chai Tea Have Caffeine? A: As with all black-tea based drinks, the amount of caffeine in chai tea can also vary depending on the amount used. The usual amount of caffeine in chai tea is between 30 to 70 mg in an 8 oz cup. Cappuccino and latte, also know as cafe latte, are two of the most popular coffee drinks. Both are of Italian origin and are made using hot milk, the difference is in the ingredients and how the drink is prepared. 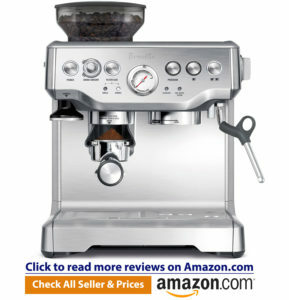 A cappuccino is made with an espresso-blend coffee, hot milk and steamed milk. A traditional cappuccino usually has a two-centimeter-thick layer of steamed milk foam on top. Unlike cappuccino, lattes may be made from any type of coffee, tea, coco, latte or mocha. The regular American latte typically contains one-third espresso and two-thirds steamed milk topped with a layer of milk foam. By contrast, the traditional Italian latte is not topped with foamed milk. When comparing the caffeine content of Cappuccino vs. Latte, because cappuccino and lattes a made with shots of espresso, both drinks have the same caffeine as an espresso, which is 30 to 50 mg of caffeine per fluid ounce, or per shot.